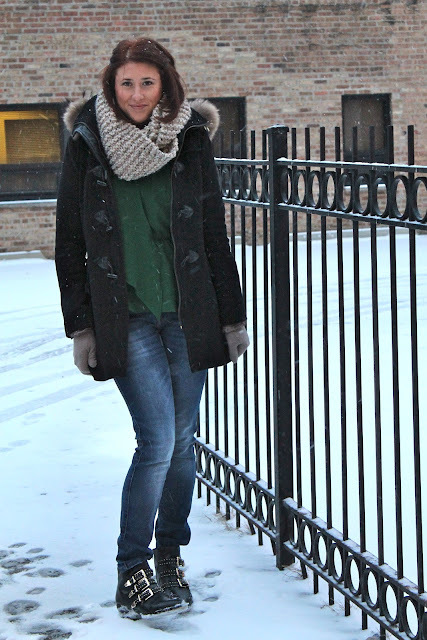 HOT PINK style: Green and Snow! We finally got a little snow here in Chicago! When I got to my car I was reminded why you never wear short booties if you plan on wiping the snow off your car because they act like a little cups for the snow to fall right into. Luckily they zipper right off and can be shaken out! I got this green blouse at Zara a few days ago as part of their sale that is going on now. Check it out here if you would like to see the whole thing. It's the same material as this other Zara blouse that I have and love, so I also bought this top in black too. A girl can never have enough perfectly drapey black blouses. And since I'm dressed in almost all Zara, what better day to share this artice from the New York Times my husband found that makes me love and appreciate Zara on a whole different level. It also made me realize that if I like something I see there I should purchase it and return it later if I change my mind. Because of how they stock their items it may not be there later or ever again! Interesting read and worth your time. Ugh. Nothing I hate more than removing snow from my car. I think my new goal in life is to live somewhere with a garage. I just went to the Zara on Michigan Ave tonight and it was still there too! Get it while its still Available!